After flying from LAX to Honolulu, we were six hours behind our normal East Coast time. Time zones are so hard to get used to. We landed in Honolulu, grabbed a rental car, and started the drive to Aulani. 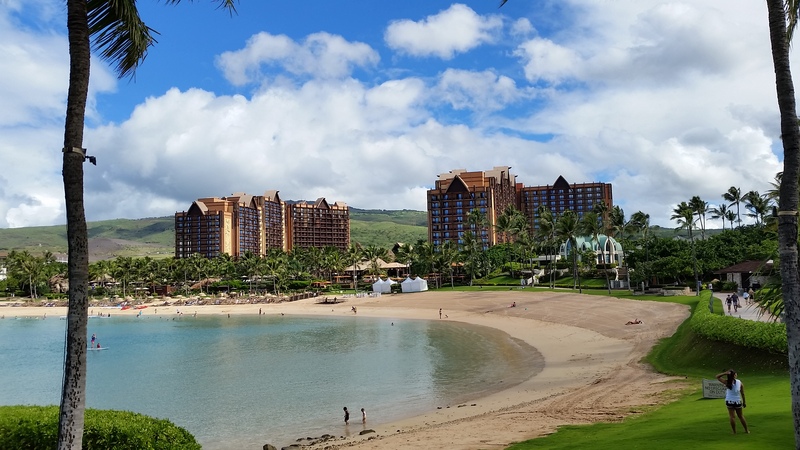 Aulani is Disney’s resort in Ko Olina which is on the island of Oahu, about 20 minutes from Honolulu without traffic. We did land right in gridlock time so that added probably 30-45 minutes more to our drive time. No worries though, as is the mantra there. The traffic eventually cleared up and we were on the way. I had read that Oahu had a weird road system when planning the trip and that was an understatement. Lots of roads that change names, even though they are the same road, just to change back to the original name. For this Virginia girl, all the Hawaiian names really threw me for a loop too. The crazy thing is that our GPS voice, who can’t pronounce normal words correctly half the time, didn’t even stumble on those Hawaiian words. Super strange. So Ko Olina. I could live there. This is a newer development on the west side of the island and features vacation and residential properties, like a gated community. (OK, so I like my fanciness.) There are resorts in the area and they sit on four man-made lagoons which provide protected access to the Pacific. 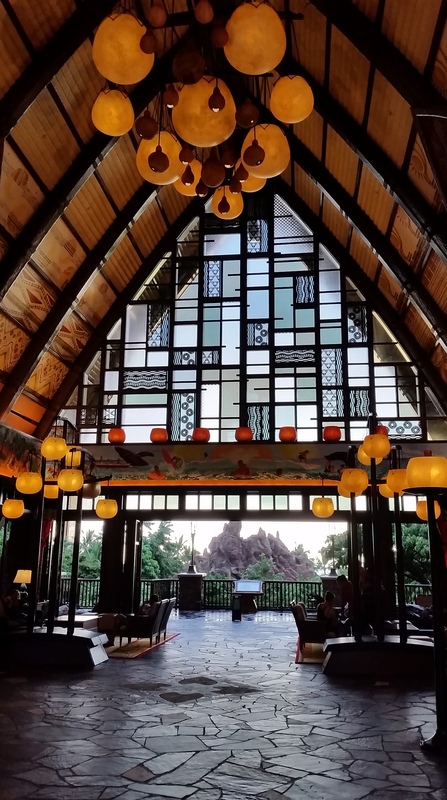 Aulani sits at the first lagoon and man, color me impressed. This resort blows anywhere I’ve ever been out of the water. The attention to detail here, the grounds, location, service, and hospitality were mind-blowing. Most all of the staff seemed to be native Hawaiians which really added to the comfort and ambiance of the resort. Super friendly. At check-in we were given gifts: a traditional lei for me, a Menehune necklace for my daughter, and a Kukui bead necklace for the hubs. More on Menehune later. Our room was perfection, overlooking Waikohole Valley at the resort. That’s what Aulani calls the water feature area in the center of the resort buildings. A lazy river, waterslide, child waterplay area, infinity pool, hot tubs, koi pond, etc. are all found there. Talk about amazing. 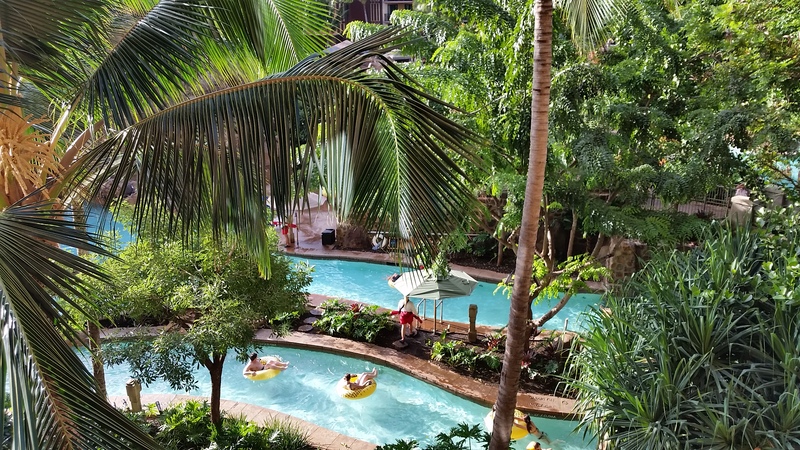 I’m not a huge fan of waterparks and things like that but Waikohole Valley might have changed my mind. We spent so much time drifting on tubes in the lazy river and bobbing at the edge of the infinity pool that it was heavenly. The lagoon area was super nice too with abundant beach chairs, umbrellas, watercraft options, etc. I could give you a lesson on how to climb up on a floating “island” raft in the lagoon but no videos, please. I have never laughed so much trying to haul myself up onto something and not fall back off into the ocean. So much fun. Back to the Menehune. 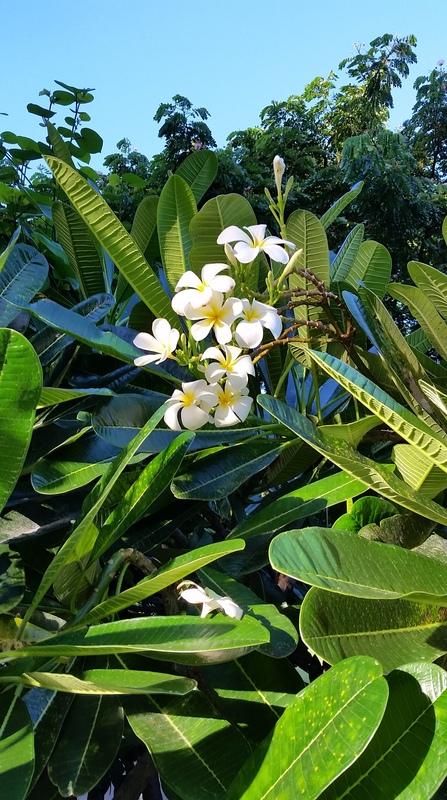 Menehune are little shy, mischievous little people in Hawaiian legend that Disney uses throughout the resort as a fun way to tie in culture to the property. There is a Menehune Bridge play area for the kids (and adults because you have no idea how much fun it is to run through a good six inches of water and have buckets of water being dumped on your head at the same time, seriously!) and an interactive game where you solve puzzles and riddles related to the Menehune around the resort. You’ll find Menehune statues all throughout the property so that by itself becomes a neat scavenger hunt. Food at Aulani is quite the mixture with grab and go all the way to high end. Being a vegetarian, I don’t tend to go for high end as it can be hard for me to get my money’s worth. We spent a lot of time at the Ulu Cafe, the grab and go location at the resort and have no complaints. Great service there and a wonderful Margarita flatbread that I think I ordered every day. You can also get the famous Dole Whip and Hawaiian Shave ice in Waikohole Valley which make for quite excellent snacks. We did venture to a nearby small shopping area and had dinner at a place called Just Tacos. It didn’t disappoint either. We ate there twice and I wouldn’t hesitate to do so again with their plentiful options, yummy food, and caring service. 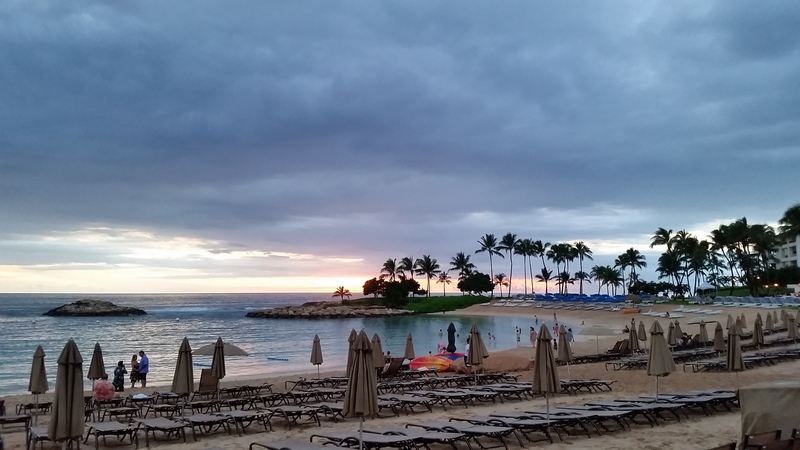 I had high hopes of day trips from Aulani and visiting the touristy places on Oahu. Didn’t happen. 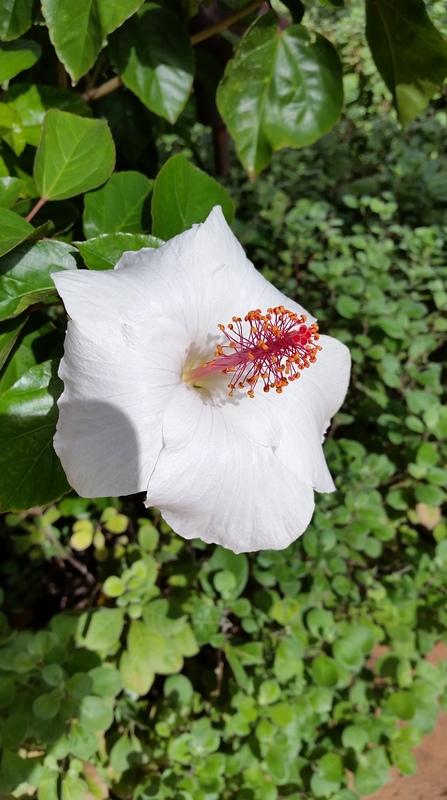 We went out one day to Pearl Harbor and stopped at Punchbowl (the National Memorial Cemetery of the Pacific and also an extinct volcano) with lunch in Waikiki but that’s it. The resort had so much to do that I couldn’t pull myself away. Next time maybe. Pearl Harbor was moving, to say the least, and I’m so glad we took the time to go there. The USS Arizona Memorial is beautiful yet heartbreaking for the men and their families that so needlessly died there. The Honolulu traffic and crazy roads led us back to Ko Olina though, calling us to get back in the pool. 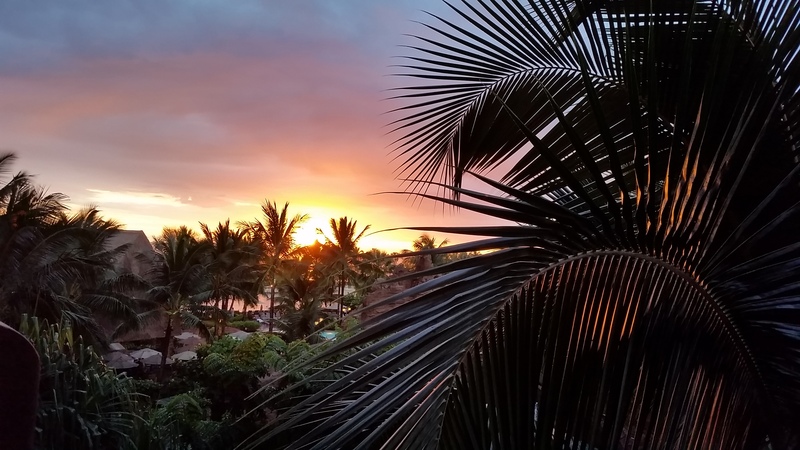 In typical Disney fashion, Aulani offers so many things to do with some at a fee and some for free. We like free so we enjoyed a nighttime hulu show that also featured traditional Hawaiian music, craft making, and had all of the guests sitting on warm straw mats. Fun! We also participated in an animation class where we learned to draw Stitch and painted our own animation cels. On our final night, Aulani was celebrating Halloween Hawaii style so we had a costume party, craft making, and carnival type games for small prizes. The characters were out in full force in their Halloween costumes too which were a treat. So much to do and never enough time. When our time was up, we loaded onto the plane and spent the next nine hours in the area flying back home. What a long flight and nowhere near enough sleep! It was completely worth it though and I hope to be back at Aulani, floating in the lazy river, soon!